The evergreen Thuja occidentalis hedge stays dark green year round and holds its needles throughout the winter. The distinctive narrow conical shape and dense foliage makes for a sturdy and visually appealing hedge. An arborvitae (Thuja) hedge planted in biodegradable cardboard container, ready to be planted in a landscape. Dense yet feathery foliage on this arborvitae (Thuja) hedge allows for excellent privacy in all seasons. This row of arborvitae (Thuja) hedge is on its way to 6' high before it will be harvested. Small starts of arborvitae (Thuja) are staged in a greenhouse ready to be planted in the field to form InstantHedges. 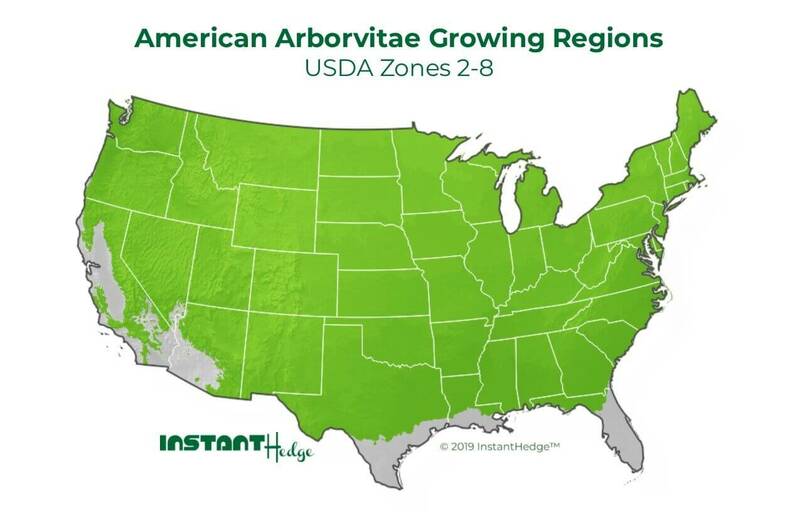 The American arborvitae hedge needs adequate water to stay healthy and may need more than a moderate watering schedule if planted in extreme heat. For wintery landscapes, the tree’s dark green can make a nice accent in an otherwise colorless yard and works as a great accompaniment to flowering plants during the rest of the year. Also read about Emerald green arborvitae hedge. An outdoor seating area like this is made much more private with the evergreen arborvitae (Thuja) hedge in the background. Arborvitae hedges can be grown very tall like this privacy hedge, and some small varieties can be used as knot garden borders. Arborvitae (Thuja) forms an elegant boundary between this garden and the landscape on the other side. Soft foliage on arborvitae (Thuja) makes for a nice contrast with artistic pottery such as this. A faster-growing arborvitae (Thuja occidentalis) hedge like this forms an effective wall to make a private yard feel more secluded. Create optimum privacy and wind protection around a swimming pool area by tightly bordering with a dense arborvitae hedge. A stone path is bordered with this lush, evergreen arborvitae (Thuja occidentalis) hedge. This seating area amid the water feature is closed in with an arborvitae (Thuja) hedge. A consistent hedge planted at a finished height can create a wonderful backdrop for a flower garden.